Decorate a homemade gift in creative wrapping paper. Homemade items can make perfect gifts for a friend's upcoming birthday. A few simple, inexpensive materials will be all you need on hand. Remember to keep her personality and interests in mind when creating the gift. 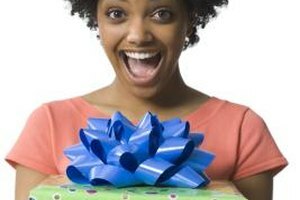 Gifts should be based on what a recipient likes or needs, according to psychologist Susan Krauss Whitbourne, Ph.D., professor of psychology at the University of Massachusetts Amherst, in her "Psychology Today" article "Great Gifts Don't Have to Break the Bank." Present her with a gift that was made especially with her in mind. A wrapped gift basket pertaining to your friend's interests will be a fitting birthday present. Place tissue paper in a medium-sized wicker basket and gather simple items sure to appeal to her. If your friend is an artist, tuck in a blank canvas, paints and a new paintbrush. Or, for a friend who enjoys baking, place a few baking utensils; specialty flours, sauces or spices; and decorating supplies inside. Consider a movie-themed basket for a cinema buff. Place classic DVDs, packaged popcorn and your friend's favorite candy inside. Wrap the basket in cellophane and tie with a decorative ribbon. Present your friend with her own birthday dessert in a simplistic way: Give her a birthday cake in a jar. Prepare a white cake mix according to the package instructions and add in sprinkles. Crumble the baked cake into several pieces. Layer crumbled cake in the bottom of the jar and then scoop in some colored frosting on top. Continue layering until you reach the top of the jar. Having placed the lid on top, string a printed birthday message through a ribbon to tie around the jar. Alternatively, create birthday-themed cookies with cookie cutters to resemble balloons and party hats. Self-pampering will likely be part of your friend's birthday agenda. Make her items that will encourage her to relax and take time for herself. Create homemade soaps by first melting glycerin soaps in the microwave. Pour the melted soaps into molds that suit your friend's personality. Let the molds cool and harden for an hour and then pop the soaps out. Wrap the soaps in tissue paper or cellophane. Additionally, create a miniature manicure kit for her. Place manicure tools, colored nail polish and nail design stickers inside a jar. Tie a ribbon around the jar with a personalized birthday note. The birthday lady will appreciate a sweet-smelling scent to fill her home. Make a potpourri mixed with oils that you think your friend will like the smell of. Or make a chocolate- or vanilla-scented potpourri blend that will smell like a birthday cake. Place the blend in cellophane or a satchel and tie with a ribbon. Alternatively, give her a photo album to sit in her living room. Get a wooden picture frame and paint it in your friend's favorite color or a hue that will match her home decor. Insert a picture of you both inside or an original birthday poem. What Kinds of Gifts Do You Give a Woman for Her 32nd Birthday?